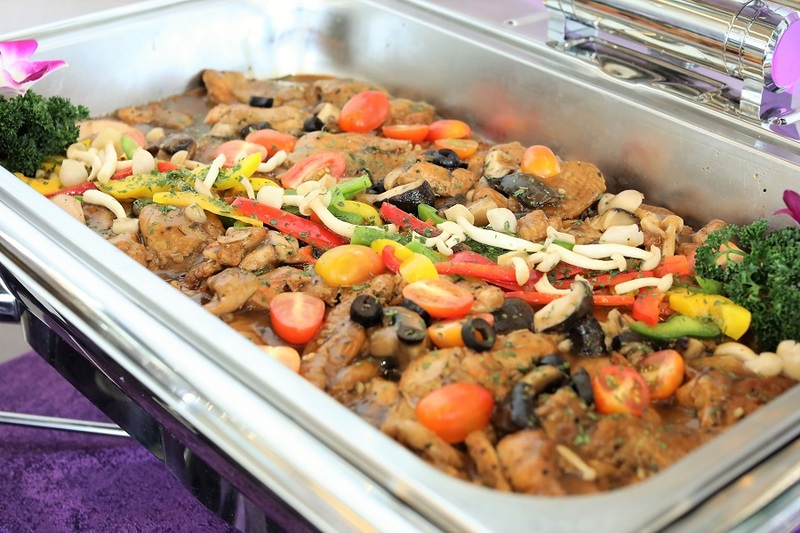 Looking for a suitable caterer for the office or home-parties can be either an enjoyable or stressful affair. Pick the former. I guess some of the factors people are looking for: the process must be fuss-free, cost within the budget, and of course offer delicious food. 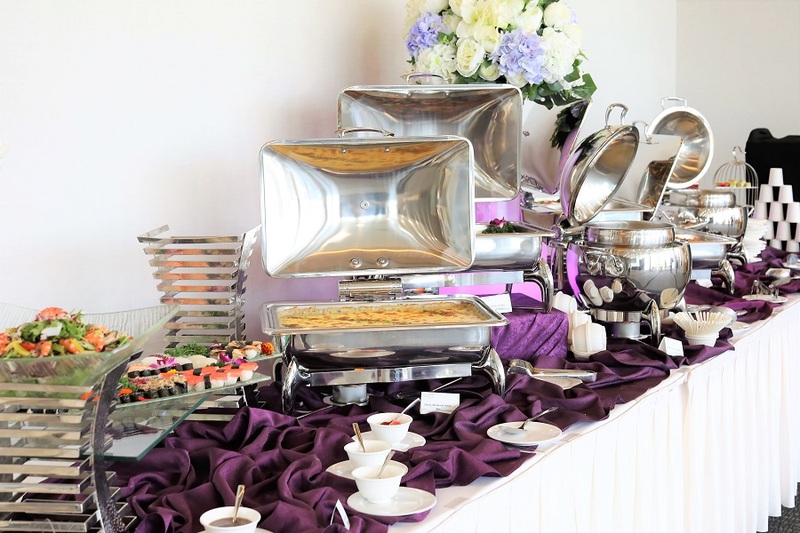 Stamford Catering has been the preferred caterer of choice for my previous company, and I know families and several organisations (whether corporate or government) also go to it as the default caterer. 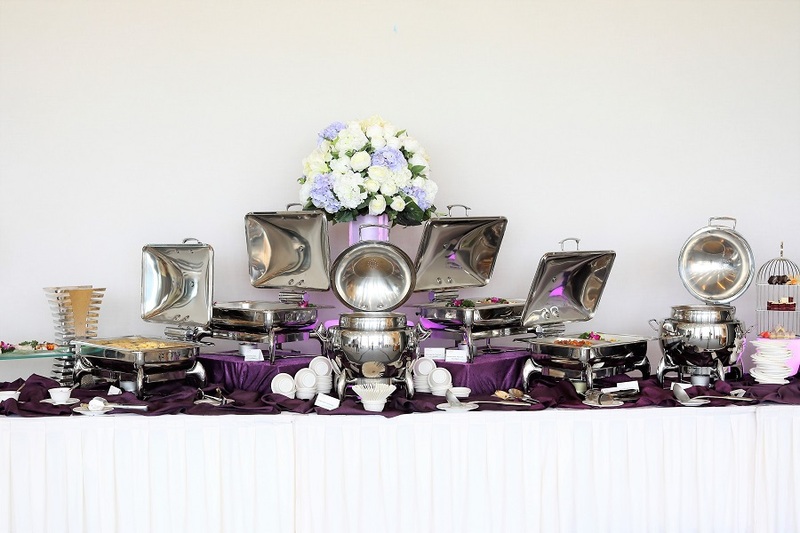 One of the key reasons is that it can provide a one-stop catering solution, and it is Halal-certified. Plus, pricing is quite affordable as well. A reason why it can keep costs lower for consumers is that it sources ingredients from the best authorised suppliers at wholesale pricing. As a result, customers get quality food and value for their money. 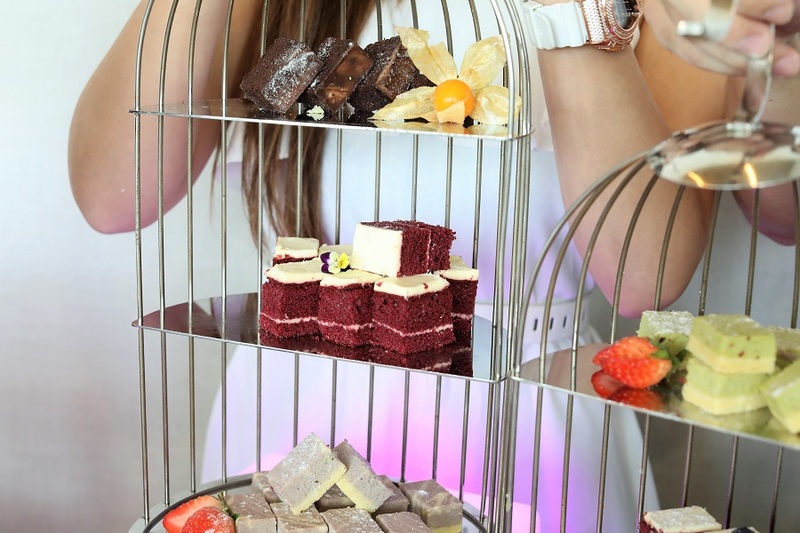 Its extensive menu includes a variety of buffet packages, party sets, mini sets, high tea, cocktail, live station and even wedding packages. 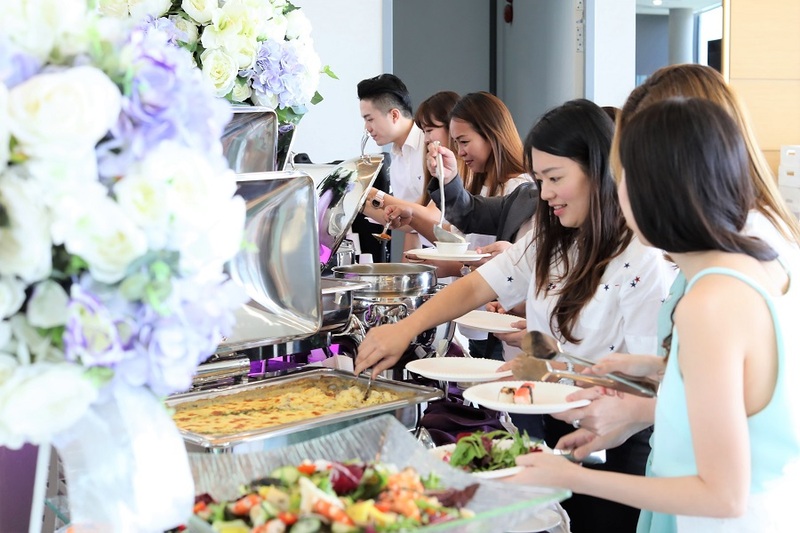 Catering for the modern companies and families is no longer like in the past, where we would be satisfied with staples of fried bee hoon and curry chicken. I think many caterers have all upped their game, paying more attention from the menu to the table preparations. 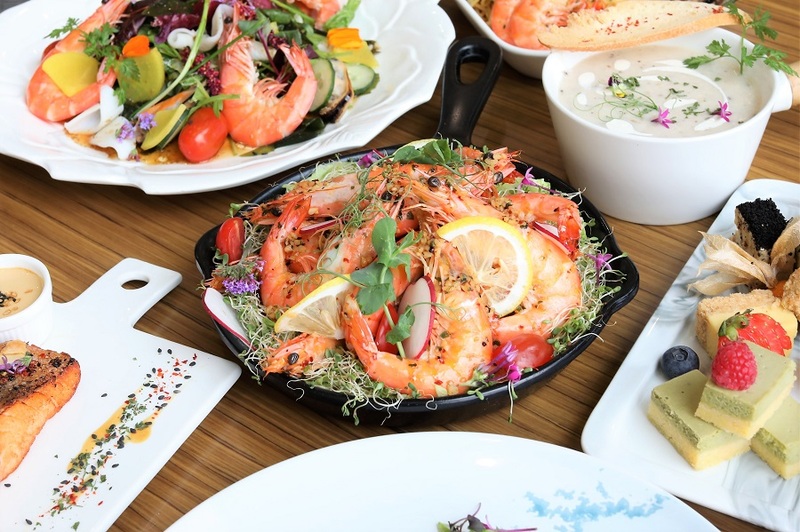 Stamford Catering has therefore launched 2 new International Buffet specials, offering Italian, French, American and Asian cuisines in each menu. 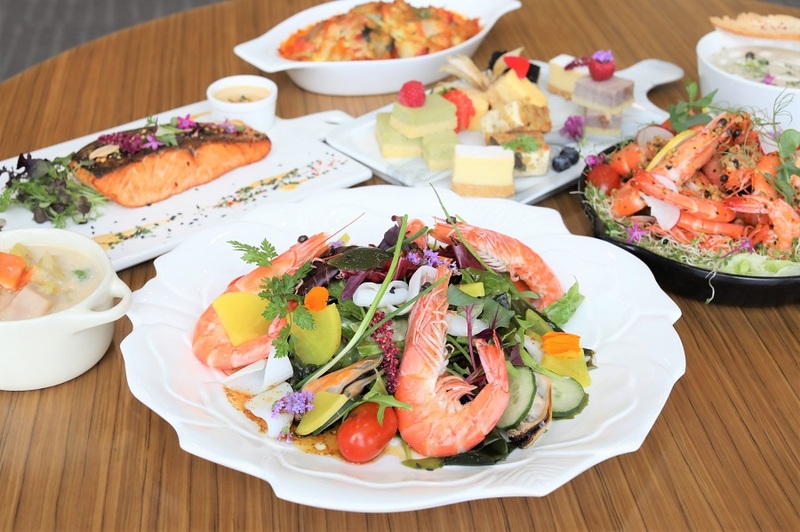 The Chef Recommended include the International Buffet A ($20+, $21.40 with GST) with 10+1 Courses, for a minimum of 25 persons. 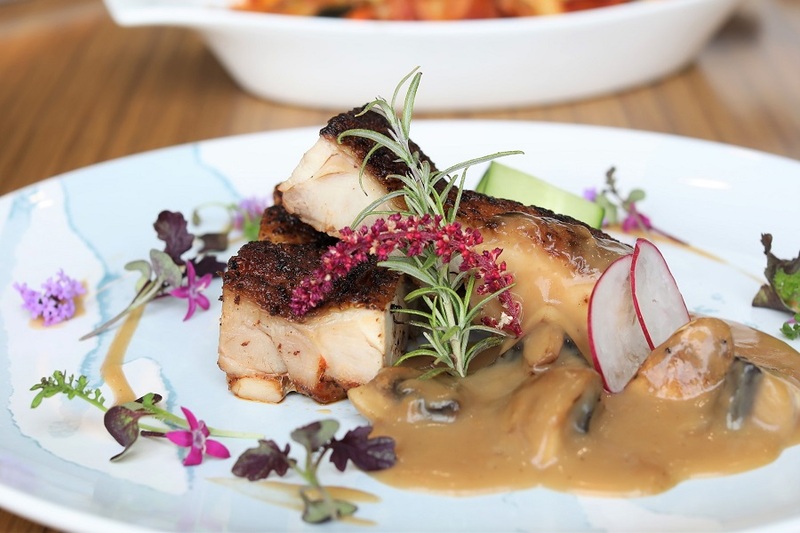 This menu includes some unexpected choices such as Pan-Roasted Louisiana Chicken with Mushroom Ragout; Roasted Butternut Pumpkin Pilaf Rice with Almond OR Classic Italian Aglio Olio with Bell Pepper Trio; and Wasabi Prawn with Summer Fruit Salad. 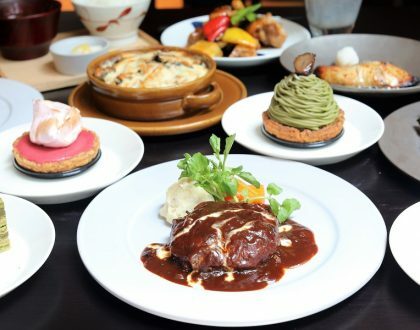 I recently tried the International Buffet B with 11+1 Courses ($25.00+, $25.75 with GST) for a minimum of 25 persons. You get an appetiser, soup, a poultry dish, a seafood dish, an ocean catch dish, a meat dish, a vegetable dish, an international delight, a choice of main, a dessert, and a drink. 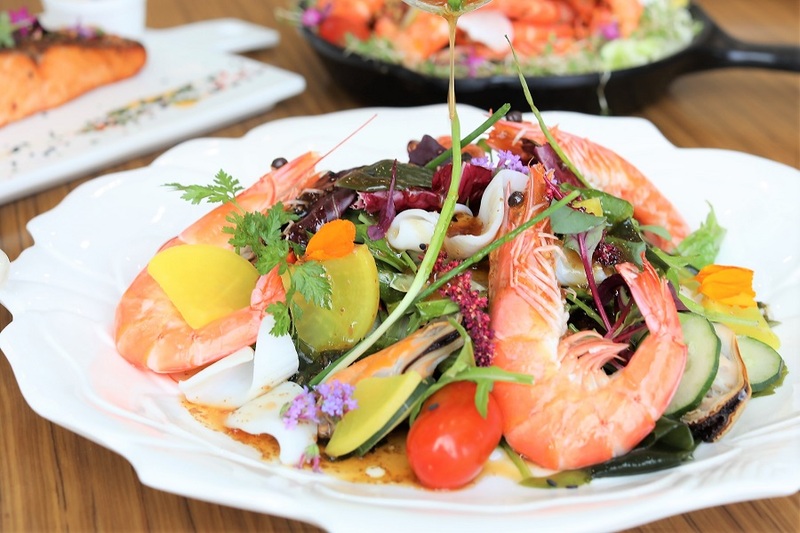 Start off with this refreshing Japanese-inspired appetiser, a salad made with a dark, green, leafy seaweed called wakame, also known as sea mustard or sea fern. It has a subtle sweetness but a distinct and strong flavour and texture. 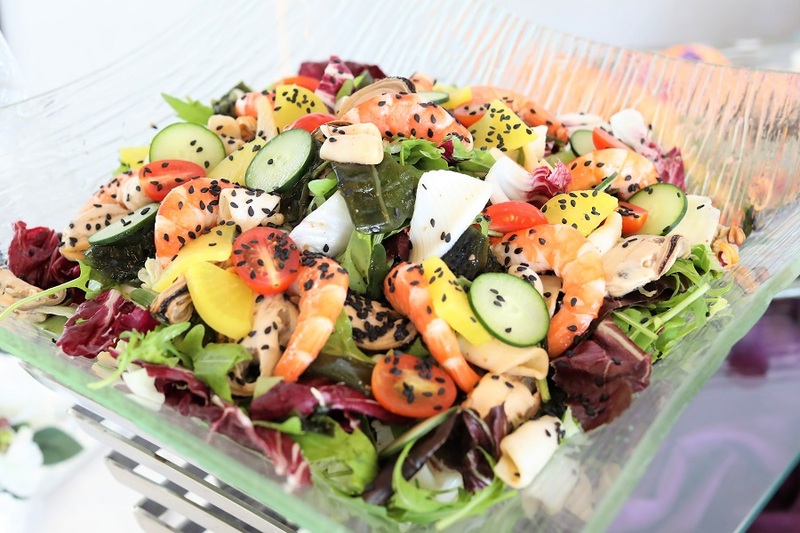 Prepared with wafu (literally, “Japanese-style”) dressing, a vinaigrette-type of dressing consisting of Japanese soy sauce, rice vinegar, mirin, and vegetable oil. Prawns were fresh and given in generous portion. Easily the most popular dish among the ladies in the office. 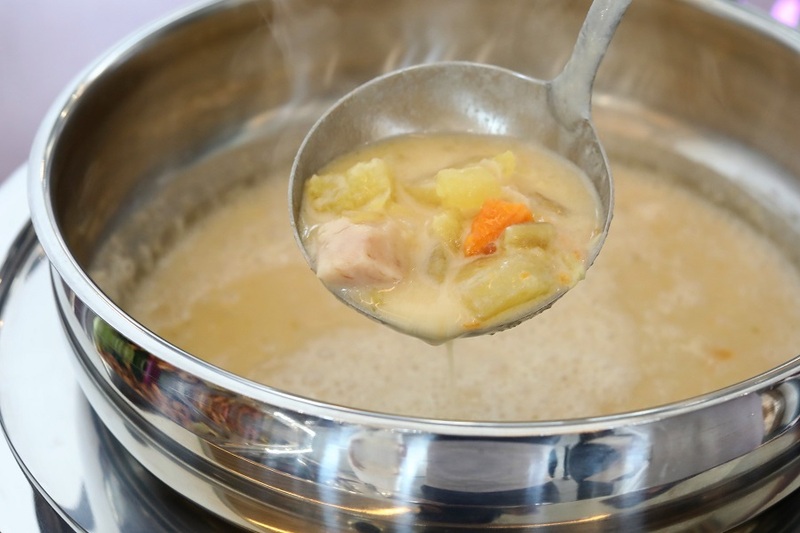 Warm your tummy with this hearty and thick soup, with a base of milk and cream. 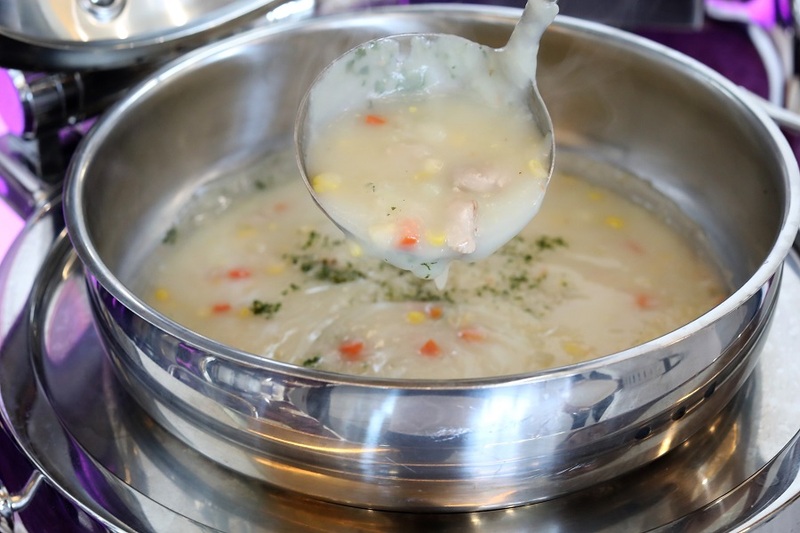 A variety of the popular England clam chowder (popular in the North American regions of New England and Atlantic Canada), this version uses corn instead of clams and adds diced chicken as its protein. Comforting. For your poultry dish, you get chicken breasts seasoned with the popular Old Bay, a unique blend of 18 herbs and spices born along the Chesapeake Bay in USA over 75 years ago. The roasting keeps the chicken tender with all the flavours locked in the juices. 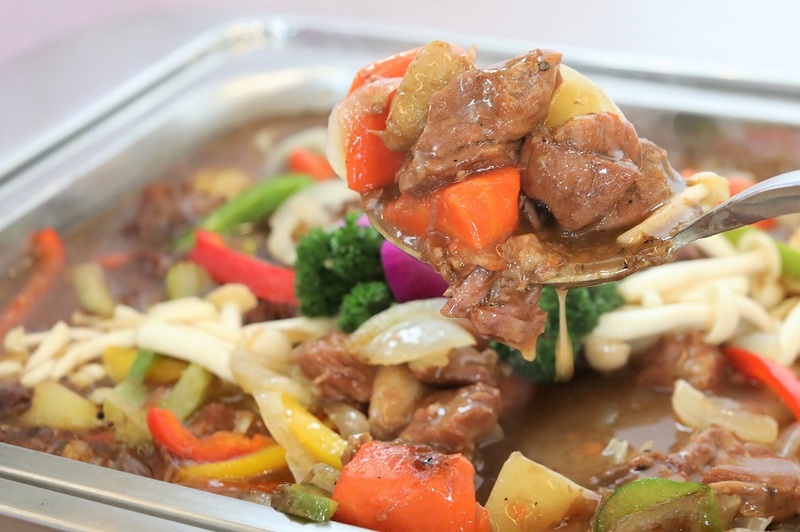 Served with a ragout of mushroom, this dish takes its inspiration from French cuisine, as a highly seasoned dish of meat cut into small pieces and stewed with vegetables. 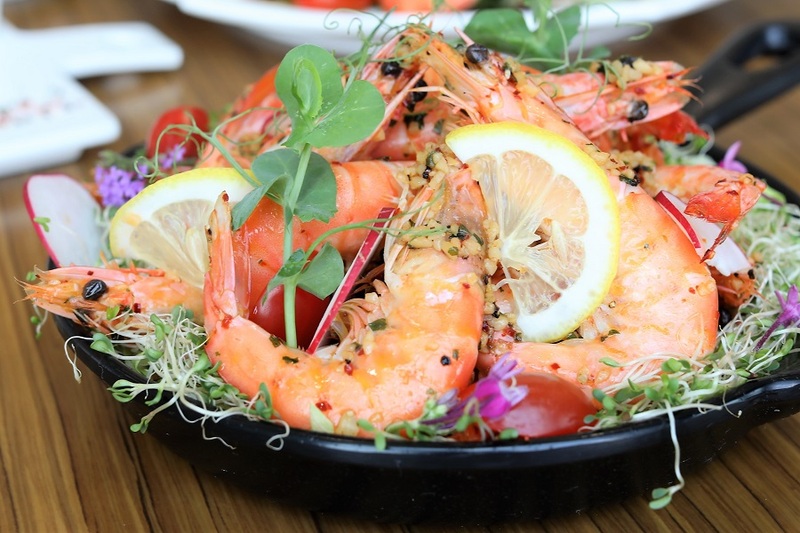 There’s a mix of Asian and European feels in this seafood dish, featuring fresh and juicy prawns quick-cooked in sizzling butter infused with minced garlic. 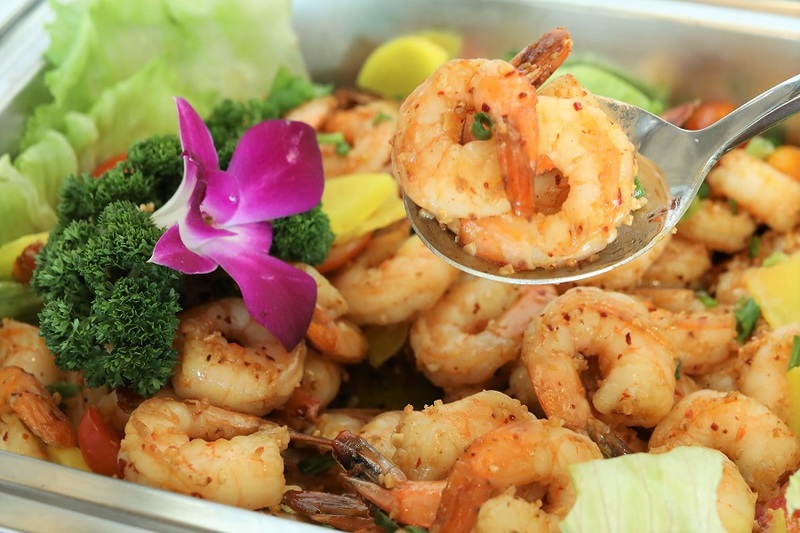 The brief but intense heat sautéing makes sure the prawns are not overcooked, and you get them succulent not dry and chewy. Included with chili pepper flakes, it’s a dish that will open up your appetite for more. A seafood dish that specifically highlights an ocean catch fish, it uses the versatile and heart-friendly salmon. 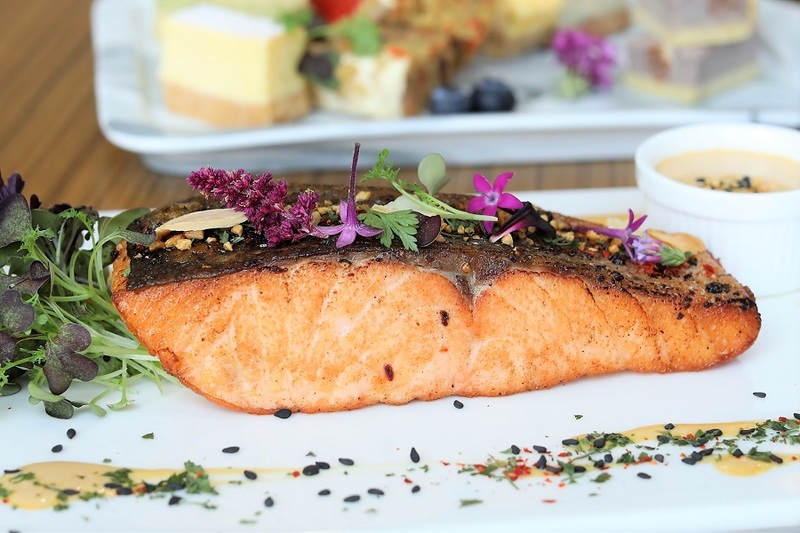 Seasoned in salt and pepper, seared skin-down then baked until cooked through, the salmon comes out moist and flaky. Dressed with a sauce that marries creamy butter and umami miso. Ready for the meat? This beef casserole has all the goodness of a hearty, filling meal – tender chunks of boneless beef, roughly diced potatoes, carrots, onions, and a whole slew of wintertime vegetables. For some, this is the taste of home, where the beef is mixed with mom-selected seasonings, dredged in flour, and then cooked ‘til brown and ready to mingle with the veggies. 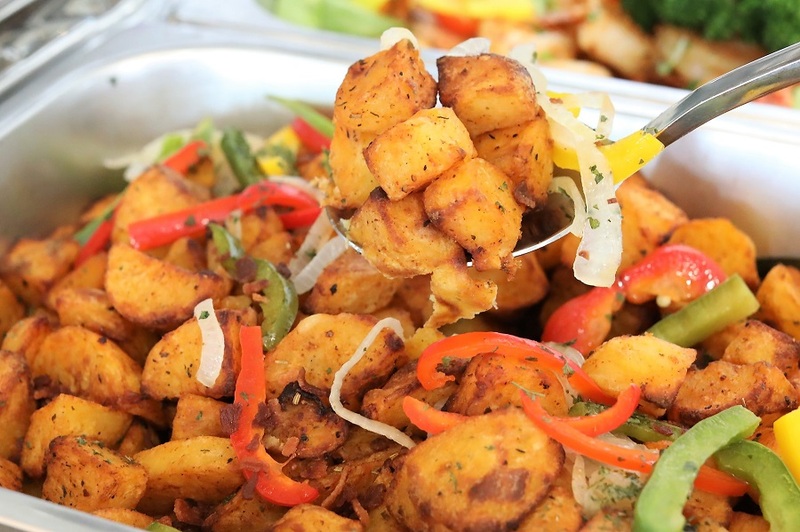 The buffet menu also comes with a much-needed vegetable dish, highlighting the authentic top-quality US-sourced Idaho potato. Known for being a superfood, with white interior and more potato flavour, Idaho potatoes produce fluffier baked and roasted potatoes. Accompanied with a turkey bacon, a Halal and lower-fat alternative to the usual pork bacon. 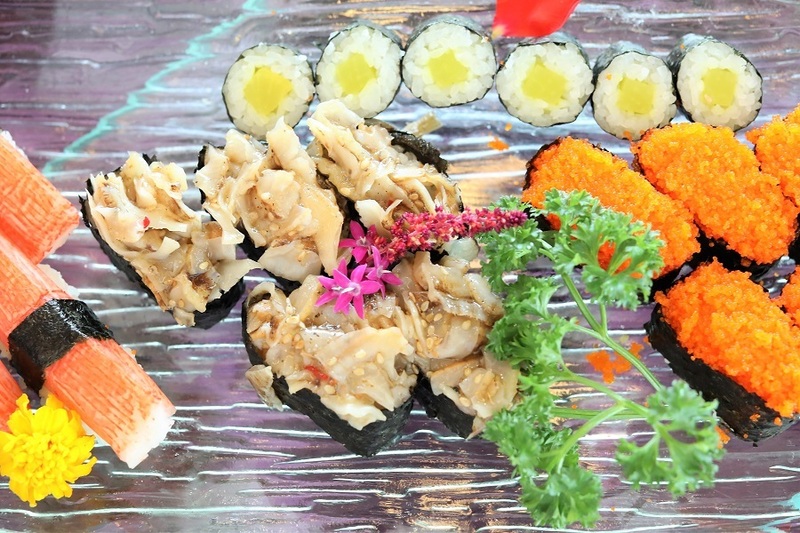 Perhaps the highlight of this international menu is the Signature Deluxe Sushi Platter, a medley of well-loved sushi using a variety of ingredients and styles, such as Kani Kama Maki (crabstick), Shinko Maki (pickled vegetables), Kappa Maki (cucumber), Tamago Maki (egg sushi), California Maki, Ebi Sushi, Unagi Sushi, and Ebiko Gunkan. 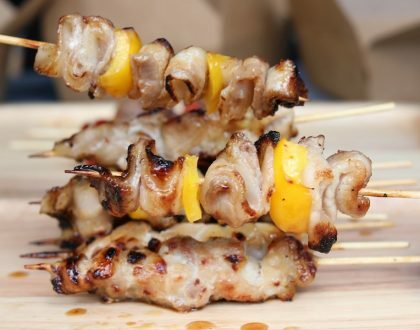 These cold appetisers are good even as a main dish. Choose between these 2 chefs’ picks for your main. It is a battle between pasta and rice and it boils down to your personal preference. 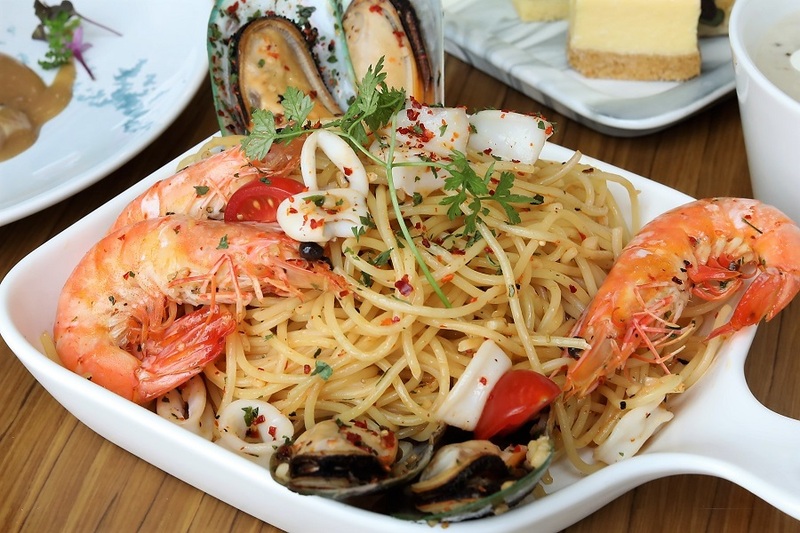 Go for the pasta prepared with al dente spaghetti aglio olio style with juicy pieces of prawns and squid. 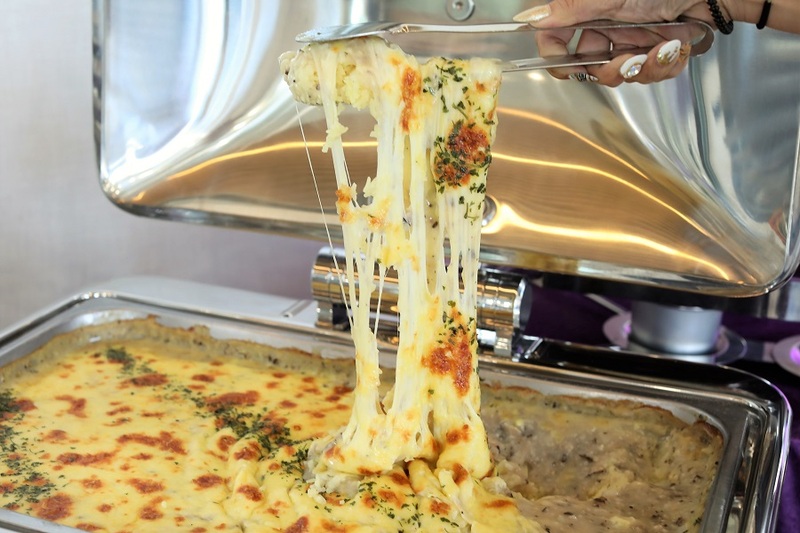 Rice lovers will enjoy this baked cheesy dish that’s packed with the savoury flavoured mushrooms. If you are fond of cheese, rest assured there is A LOT of it. 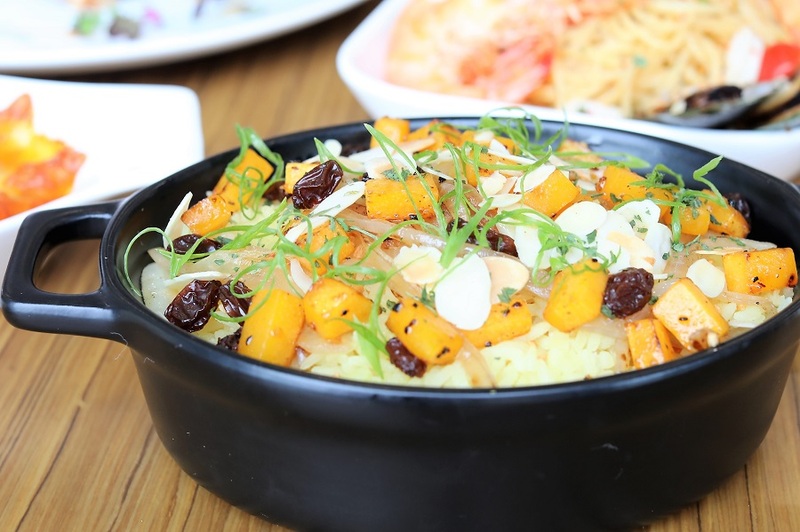 The popular Peranakan Nonya dessert, includes different coloured sweet potatoes, taro (yam), tapioca cubes. 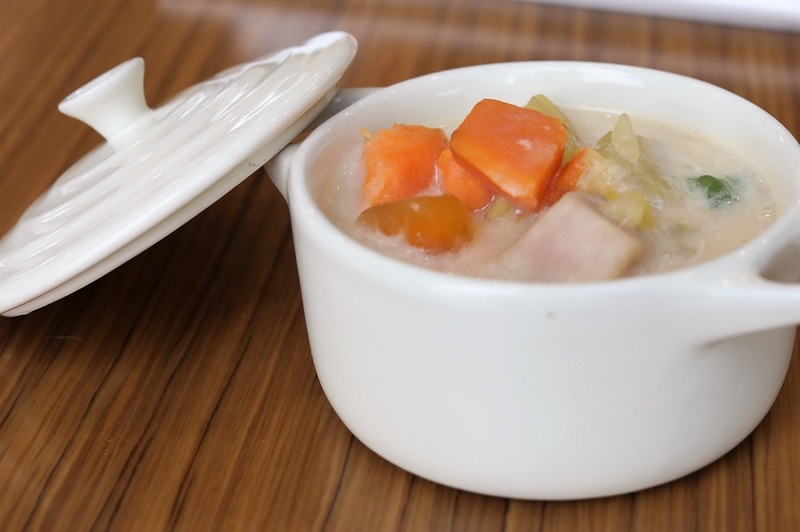 Served in a sweet coconut milk-based soup flavoured with pandan leaves. 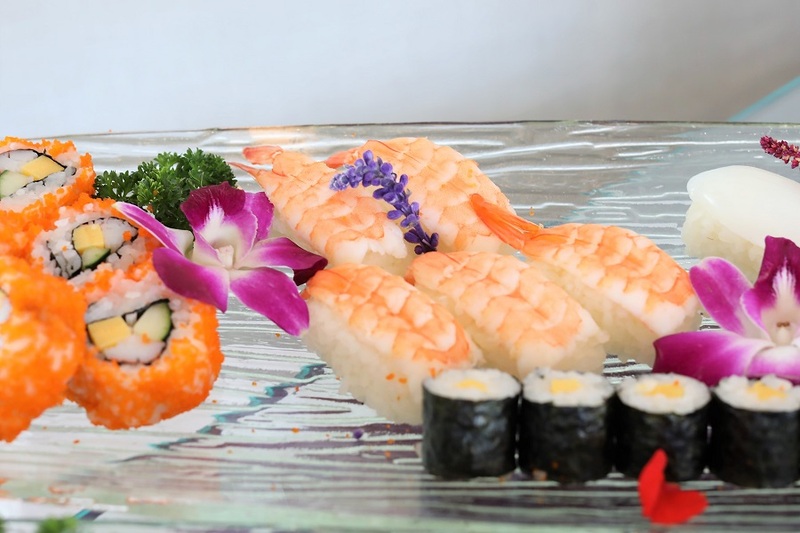 This dish is served chilled at the international buffet. 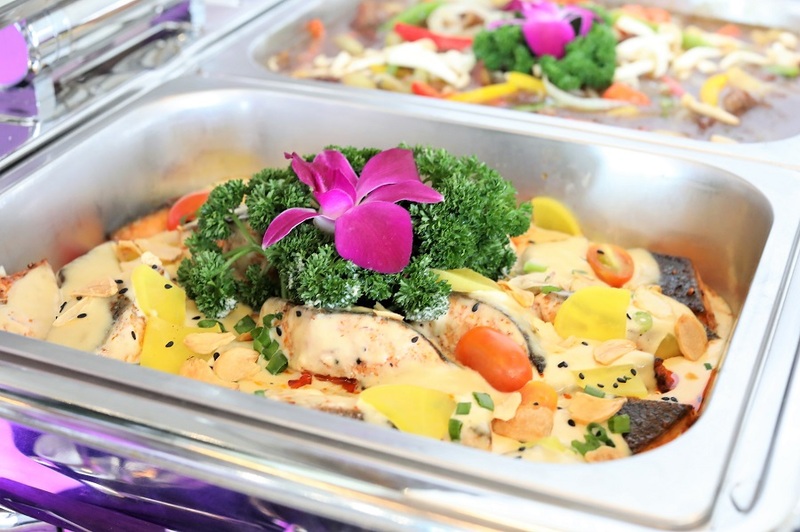 If customers like it hot, they may request for it and Stamford Catering can customise for them. You do not just get “Petit Four” at European restaurants, but at this caterer as well. 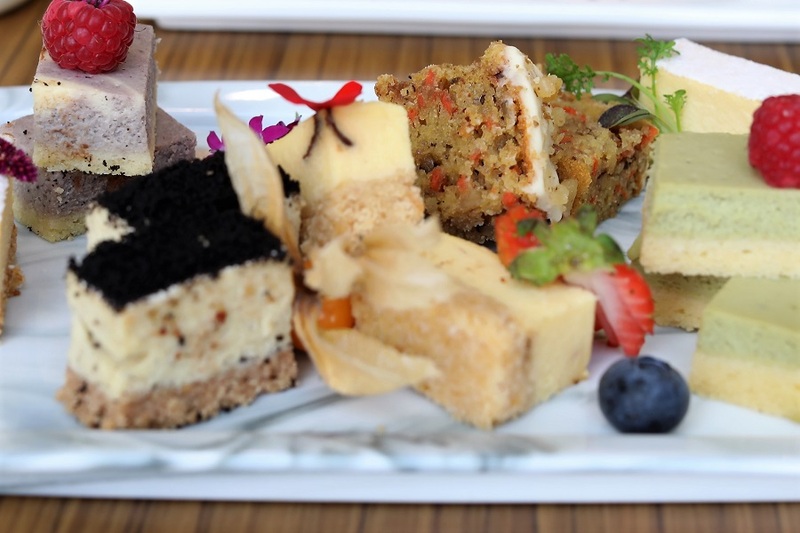 This comes with an assortment of 4 different kinds of cakes for a sweet ending, such as Mini Carrot Cake with Cream cheese, Mini Matcha Cheese Cake, Mini Chocolate Brownie, and Mini Red Velvet. (Cakes change seasonally). Also included is a drink of Nestea Iced Lemon Tea for a refreshing beverage. 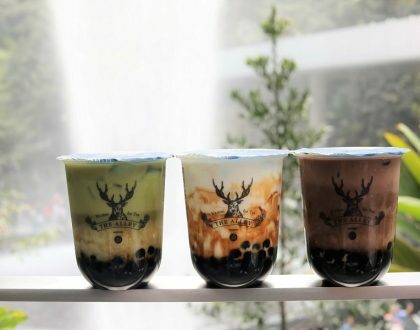 Enjoy FREE DELIVERY with any orders for events from now till 31 May 2019. Use promo code “DFD19” to enjoy promotion. * This entry is brought to you in partnership with Stamford Catering.